Fund raise for this cause. 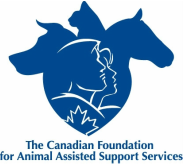 The "daily trail pass" for people who bring their own horses will be waived for a suggested donation to The Canadian Foundation for Animal-Assisted Support Services (CFAS) in the amount of $25.00. "Two-Hour Guided Trail Rides" for people who DO NOT have a horse are valued at $95 per person. This fee will be discounted by 10% during this special event. Horse Country Campground will give 10% to CFAS. You can waive your discount and Horse Country Campground will contribute 20% to the CFAS. Please reserve your campsite and guided trail rides early as spaces are limited. Call 613-867-0585, email info@horsecountrycampground.com, or visit Horse Country Campground for more information about this event and their full range of services and activities.